For years, users of the only cellphone company in the country have suffered from congestion on the lines and areas of poor coverage, but few have noticed that there is also a strict blockade on the use of key terms and phrases in mobile messaging. Arnulfo Marrero, deputy chief of the ETECSA branch at 19 and B in Vedado, Havana, was surprised on Friday morning by a complaint presented to his office about the censorship. “We have nothing to do with this, you should contact the Ministry of Communications (MICOM),” the official explained to the bearer of the complaint. “MICOM governs communications policy, because we don’t make any decisions here. All I can do is report it,” said Marrero. Censorship, however, is not yet activated on messages that are sent to foreign countries, perhaps because of their high cost: 1 Cuban convertible peso (about $1 US) per 160 characters. Blocking them would provoke more complaints from disgruntled customers and would have set off alarm bells much earlier. However, in text messages received from abroad the same censorship applied to domestic text messaging is also applied. The difference with Pakistan lies not only in the reason for blocking certain phrases or words, but also in the secrecy with which this censorship has operated for months, perhaps years, in Cuba. Few have noticed the relationship between certain expressions and communication problems, because they attribute it to the chronic problems of congestion and Cubacel’s bad service. 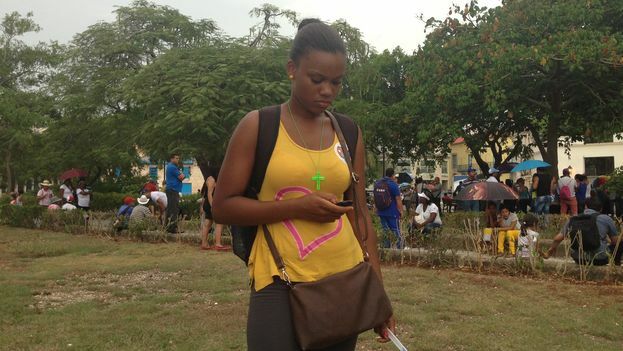 With more than three million cell phone users, the Cuban authorities have bet on few people associating errors in receiving messages with a desire to prevent the transmission of concepts and words. The meticulous choice of what terms to block has not been random. Despite the high prices for mobile phone service, where one domestic call can cost as much as half a day’s wages, the presence of cellphones in the hands of Cubans has changed ways of interacting and people find parallel paths to avoid the excessive controls the government impose on all areas of activity. “I didn’t know this was happening, although now that I read the list of censored words I’m sure I’ve used one of them at least once,” says Leo, 21, who was waiting outside the Cubacell office on Obispo Street in Havana this Thursday. “I watch the news with breakfast,” said an astonished young man next to him, who said he had not noticed blocked terms, “although ETECSA works so badly that nothing should surprise us any more.” During special days, Christmas or Mother’s Day, communicating becomes a real ordeal. During his students years at the University of Information Sciences (UCI), the engineer Eliecer Avila worked on the so-called Operation Truth. His group monitored the internet and created matrices of opinion favorable to the government in forums, blogs and digital diaries. At present, Avila leads the independent Somos+ (We Are More) Movement, which is also on the long list of terms blocked by Cubacel messaging. The presence of an intelligent filter is obvious in this case. If you type in the text “cacerolazo” – a word meaning the banging and pots and pans as a form of protest – your message will take much longer to arrive than some other text. A similar slowdown occurs if you write the names of Fidel Castro or Raúl Castro, and it is true in the latter case with or without the accented letter U. How many dissident meetings have been frustrated because the invitation message never reached the invitees’ inboxes? How many misunderstandings between couples, domestic squabbles, and uncompleted professional tasks result from the filtering of messages that include last names such as Biscet and terms such as plebiscite? Telecommunications censorship is not a new tool for the Plaza of the Revolution. Activist frequently denounce the blocking of their cellphones on December 10 th, Human Rights Day, or other times when they want to gather together. During the visit of Pope Benedict XVI to the island in September of 2012, more than 100 opponents reported the suspension of their cellphone service, along with house arrests and arbitrary detentions. A blockade of uncomfortable digital sites has also been a common practice for officialdom. On the list of inaccessible sites are portals set up from abroad such as Cubaencuentro, as well as local newspapers like 14ymedio. More than a few users manage to circumvent the censorship by sending news via email or sending offline copies of pages that pass from hand to hand thanks to technological devices like USB flash drives and external hard drives. Only since 2008 were Cubans legally allowed to have a cellphone contract and Cubacel currently has over three million users. Last year 800,000 new lines were established throughout the island, despite the high cost of a national call, the equivalent of half the salary of a working day. In July 2014, the governments of Cuba and China signed an agreement on “cooperation in cyberspace.” China has transferred to the island its experience in monitoring and blocking content on the web, especially what they have learned from their launch in 1998 of the so-called Golden Shield Project, known worldwide as the Great Firewall, which employs more than 30,000 censors. Raul Castro’s government has not only copied China’s content filtering strategy, but also the creation of its own social networks to discourage Cubans from using Facebook, Twitter or Google Plus. To achieve this an ersatz Wikipedia, called Ecured, was created, along with a platform-style Facebook dubbed La Tendera (The Shopkeeper) and an unpopular substitute for Twitter known as El Pitazo (The Whistle), all with little success. We now know that the Cuban Government wants to go beyond such crude imitations and aspires to follow in the footsteps of its Great Chinese Brother, which has a long history of censoring text messaging through a “keyword list.” A user can have their entire messaging function disabled if their content does not pass the filter of the censors. In the city of Shanghai alone, the Hong Kong newspaper Apple Daily reports, messaging has been blocked for some 70,000 users.